Fantasia (Buena Vista, R-1990). 50th Anniversary One Sheet (27" X 41") DS. Animation. Starring Leopold Stokowski, Deems Taylor, Julietta Novis, Corey Burton, Walt Disney, James MacDonald, and Paul J. Smith. Directed by James Algar, Samuel Armstrong, Ford Beebe, Norman Ferguson, Jim Handley, T. Hee, Wilfred Jackson, Hamilton Luske, Bill Roberts, Paul Satterfield and Ben Sharpsteen. A Walt Disney Production. 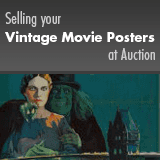 An unrestored poster with an overall presentable appearance. It may have edge wear, creases, small tears, surface scuffs, and unobtrusive stains. There are soft horizontal creases in the image area from being flattened when rolled. Please see full-color, enlargeable image below for more details. Rolled, Fine+.